Also BRIGA VILLAS STUDIO 1) was like house and STUDIO 2) renovatet 2008 in traditionel Islandstil, as for instance designerlights, TV -SAT WELAN Telefon, marble floor, queensize bed, dining place with Canape (Sofa), kitchenette, terrasse with eating place and a sunbed. Unlike most accomodation in Santorini also the studio 1) has been renovated to provite comfort in winter with floorheating in the bathroom and marble panel heating in th other room . At this time of the year that would be an ideal place for guests who want to escape from the stress of every day life. Here you will find an oasis of tranquillity accompanied with a spectaculär view. High up over the Caldera with an unique panoramic view over the deep blue Aegean Sea in traditional island style, yet with modern comfort, BRIGA VILLAS (HOUSE and STUDIOS) are waiting for you. Let yourself be spoiled by the island, the magic light and the unique ambience of the refursbished accomodation. The Briga Villas are arranged in high quality and tasteful furnishing, with natural light and designer lighting, SAT-TV, DSL- WLAN, etc. Briga Villas HOUSE has a sleeping room with dobbel bed and a passable wardrobe, a generous sitting room with sofas dobble bed, a bath room with bath toube and bidet, a fully equipped kitchen with dishwasher and cooker range. It has a spacious dining room (sunroom ) . A large glass door can be completely opened, so that this room becomes part of the terrace. In winter this glass door makes the sunroom also wonderfully warm and "gemütlich". Briga Villas are providing comfort also in winter with marble panel heating, to be ideal for guests who want to escape from the stress of everyday life to find an oasis of tranquility accompanied by a spectacular view. is a small, quiete and picturesque place, about 800 metres north of Fira. It has informal taverns, stylish restaurants with international cuisine, cafés and mini-markets. But if guests want to have a bit more variety, Fira, the main town of the island, is only 10 minutes walk (about 800 metres). Here you will find everything: larger supermarkets, restaurants, cafes (including internet cafes), boutiques, jewelery shops, museums, and also fitness studios. Fira has a very intensive nightlife with discos and elegant bars which are open almost the whole night (until the sunrise). Some of these continue to be open in the winterseason, especially at weekends. The beaches are on the other side of the island (about 3- 6 km) and can be reached by bus or taxi. You can also rent a car or a motorbyke. There are car parking places beside the main road, nearby. From May until October by charter direct flights from European cities, or all the year via Athens by plane or ferry. Love and Santorini kept me here. I am living some time here and some time in Germany Every time, when I am at Santorini,I am staying in my House. I have my little dog LEON with me. Briga Villas are more private and not so much for profit. The beaches of Santorini due to its volcanic island are black. Santorini is famous of its CALDERA with white cave houses and white chapelles and blue cupolas. The beaches are situated on the convexe side of the island. Santorini/ Caldera has cave houses. In summer cool and in winter warm. Caldera is not to compaire with other holiday places. We stayed in the lower studio villa for 5 nights and found it cozy, clean and well equipped. Patios provided comfortable seating to enjoy the postcard views of sunsets, the cliff side village and the blue sea. The owner, Brigitta, was a welcoming host providing us with tips and ideas about the area. Dining, shopping and groceries a short walk. 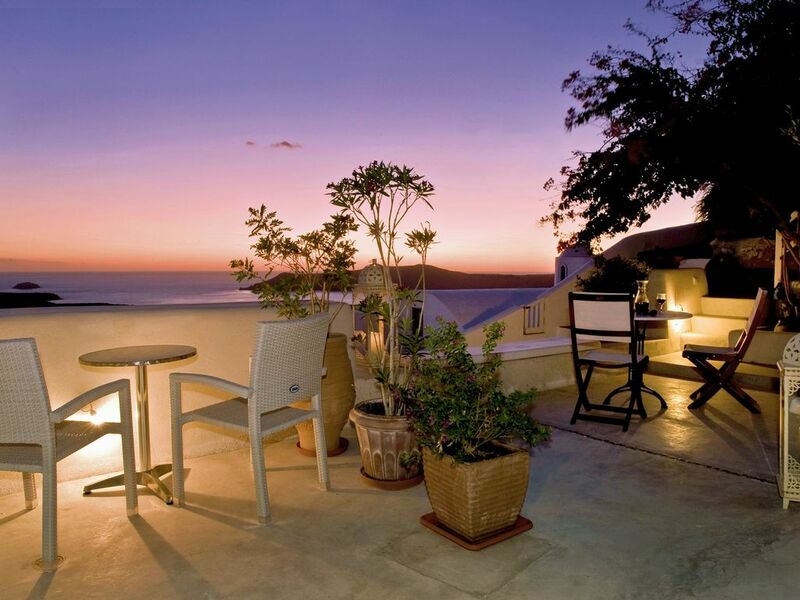 We would definately reccomend this property to anyone visiting beautiful Santorini! It was a wonderful time to have these guests. Perhaps they would come again. Perfect trip with perfect view!!!!! There’s a whole lot to say and nothing to say. Briga was such a nice lady, a superb host, and all around lovely person. She has two little dogs that she cares for and they’re both very sweet. My wife and I stayed here for 4 nights. The location is perfect, as we were steps (literally) from several restaurants and shops. We would suggest The Golden Sunset, and speak to Eddie. He is the manager/owner and has a sister from the states(KY) who owns restaurants. He was so accommodating and pleasant. Make friends with on your first day and you’ll be well taken care of for the remainder. Wine to the rim, my friends! The condo was lovely. Everything was wonderful. We enjoyed our showers, small kitchen (for leftovers), and, of course, the fabulous view from either our shared deck or private rooftop terrace. The sunsets were amazing, to say the least. If you get upset, mad, or sad, just take one look at the view and remind yourself that there is no reason for it. Be sure to visit the volcanos and other islands, but if it’s just a short trip, enjoy and make the most of it. Once again, Briga was amazing and we couldn’t have asked for a better hostess. I have very very often so nice guests, that I feel that good friends are leaving. The same happens to my little dog Leon (the only one I have) . He needs a little time to become trustful to the people, and then he is missing them, too. Brigitta not only has a beautiful place but she is a great host. We grabbed breakfast at her terrace every morning with the most splendid views. The location is great just halfway between Fira and Imerovigli which have some of the most photogenic spots. Overall our experience was 10/10. I am going to recommend it every time. Our stay at BrigaVillas in September 2018 was terrific. The space was adorable and unique. The owner was onsite while we were there and was extremely helpful and kind. Sunset views from the terrace are world class! While we were there it was extremely hot so living quarters get a little warm to sleep. Careful fan placement is helpful but the pros certainly outweigh that minor incovenience. Would highly recommend BrigaVillas, it is a once in a lifetime experience! Every time I am a little bit sad, when my guests are leaving. But perhaps they will come once upon a time again. For next year I plan SLATS DOORS to open the inner doors and let a lot of air coming in. Great place and fantastic view of Santorini. Great location and host! Briga's place was a nice quaint place in Santorini with exceptional views. We spent a few nights enjoying the view from the two balconies. Briga was super helpful and gave good tips for restaurants. Definitely worth it! Thank you Tanja and Vinay for your your friendly company. It was a pleasure to have you here. Perhaps one a time I can welcome you again to my Briga Villas. Beautiful Stay in Studio 1 ! My husband and I had a wonderful time in Firostefani. The location was perfect - quiet at night yet still so close to everything. The buses were very helpful and reasonable (about 2 euro to get from Fira to anywhere on the island - you can get to Fira by another 1.60 Euro bus or walking). We appreciated Brigita's environmental sustainability focus. In an island run on generators, it was nice to feel we were helping avoid congestion by not having the AC in the cave. With the doors open and fan on, it was pretty cool even in the heat of July. The views were *incredible* - beyond words. We could have spent a week just staying on the property - if there wasn't so much to see and do in Santorini. We recommend Galini's cafe, the excavation site and the hike to Skavos Rock. The size space was more than adequate for 2 people. The kitchen was small but enough for a trip, and the bedroom was spacious. There was even an extra mattress (under the bed) and a couch. Brigita has done a wonderful job renovating this property - the marble floors, bathroom and small decorative details were truly beautiful. We hope our journey find us there again soon! Thank you, Brigita! Thank you Stephanie and John.You were wonderful guests. I would wish to appreciate you again in Briga Villas. is the most southern island of the Cyclades and is famous as the jewel of Greece. Its typical and wellknown Cycladic architecture with white cubic houses, built in the cliffs high over the Caldera, the countless white chapels with their blue cupolars, give a marked contrast to the lava rocks. Guests of Briga villas Studio 1) will find breathtaking views over the waters of the Caldera (crater) to the volcans and islands, which are enhanced further by the magical sunsets. Firostefani is a quiet small picturesque place with informal taverns, stylish restaurants with international cuisine, cafés and minimarkets. It is 10 minutes walk from the main town Fira, where guests will find everything, also a very intensive nightlife. Other Activities: Fitness, swimming, diving, sight seeing, etc. Bei Aufenthalt von nur drei Nächten ( also weniger als eine Woche) wird eine Endreinigungsgebühr von € 30 erhoben.